1. Chop onion, parsley, and slice carrots for later use. Place butter in a saucepan. Next, sauté onion in butter in a 2-quart saucepan until soft but not browned. 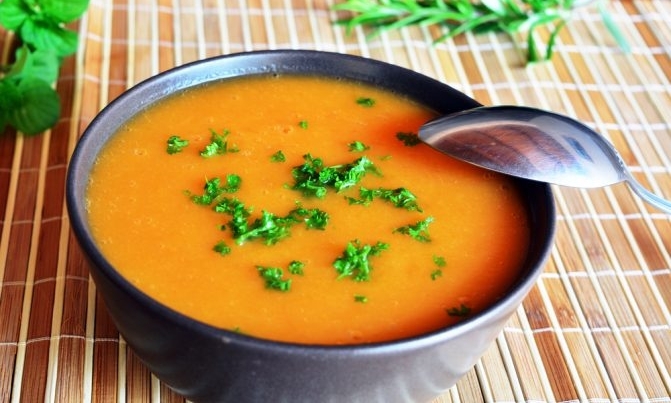 Mix in carrots, salt, cinnamon, ginger, pepper, and broth. 2. Bring mixture to a heated boil. Reduce heat to medium. Cover, and simmer until carrots are tender about 20 minutes. Remove mixture from heat. Next place mixture into a blender. Be sure to whirl mixture in a blender, about half at a time, until smooth. 3. Return to cooking pan. Add cream. Reheat to serving temperature. Taste; add salt if needed. Stir in sherry. Serve steaming hot. If desired to, sprinkle each bowl with chopped parsley.